Check price for 2 barrels and 2 bolts…special rate for minimum or small order…$600.00. I don’t think I will purchase the service..
May be a great process and turn out to be highly advantageous, but until I see some “hard test numbers” of proven results, from outside sources, I personally would not be involved. To some extent, sounds very similar to what we were told approx. 10 yrs. ago about deep freezing barrels. I’m not knocking it: it could prove to a big plus with many advantages, but I must see proof, not claims made by the seller. We tryed this about 10 years ago and got serius problem with the bore getting smaler and it shrinked more in the thicker parts of the barrel and i know that the defense industri in Sweden have had a lot of problem whith barrels and a simmular treatment. Mr. Schuster, you are evidently not familiar with either process. Cryogenics was to help stress relieve barrels and is still used by Kreiger. 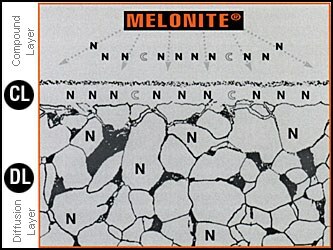 Melonite in simple terms is a case hardening process to give a very hard surface. You need to research Melonite as it is not a new process and has already been used by the gun manufacturers. It just has not been made available to the general public. As far as cryo is concerned, it helps the barrel maker in machining the barrel. I don’t think in itself that it affects accuracy. I had a rifle with the action, bolt and barrels melonited. Action near bolt stop was brittle and broke off. Some barrels developed an inside coating that had the color of rust on the patch. Not impressed. Would not do it again. Butch Lambert: With all due respect to your experience & knowledge, obviousely greater than mine, thru your very imformative postings: I tried “freezing” a Hart 22-250 ( 300 below, from Ohio) and the results were a big zero. No advantage in any category. “Armalite” and Hart does not believe in the process ( with 416 s/s). I was careful not to condemn the process, since I’ll be the first to admit I have no knowledge of it. What I did say was “show me the proof”. When buying a new car, refrigerator, replacement windows for my house, etc. claims made by salespeople mean nothing to me: I research the item in “Consumer Reports”: in over 40 yrs, that “guide” has never failed me. Butch Lambert: Your knowledge & experience is certainly at a greater level than mine, obvious from your very informative postings. I was careful to not condemn the procedure, since I know nothing about it. I am very familiar with cryo treating: had it done to a Hart 22-250 ss in ’98. The results were a big zero. Hart & Armalite also do not believe in it. All I asked for was some proof from an unbiased source of testing. For that matter, is it approved by any of todays barrelmakers like Krieger, Shilen, etc.? Trying to understand just why this is here? I understand that is a new treatment but when I called the person I talked to didn’t sound like it was something they really wanted to do to just a few items. They are set up for 5000 pounds at a time and it would just be cost prohibitive for such little orders. So for the price of the treatment I can get a new barrel. Anyway, thats the answer I got when I called and inquired. My comments were cryo aids in machining. That is the reason that Kreiger does it. I made no claims for accuracy. If you will read my post again, you will see what my experience was with the Melonite. I made no other claims. I really don’t care if you use it or not, I was asked for my personal experience and I gave it. I don’t believe that I said any barrel person has tried or recommended it. What knid of action and barrel assembly did you have Melonited? Where did you have processed? The action should not have been brittle since this is only case hardening 10 to 20 um. But you have to be very carefull when processing actions usually it will aneal or normalize steel depends on previous hardening. You have to know the history of components before processing, some components can not be process due to the draw down temperature is much less than processing temperatures. HEF will publish in a few days cost structure with a introductory minimum cost much less than standard cost of $600.00 per lot. Smith Enterprises has performed this treatment for a few years to some products, mainly Chinese M-14 recievers. This treatment typically raises the hardness of the surface, yet drops the core hardness a point or 2. This provides a better wear surface yet maintains the ductility of the core. hundreds of guns weekly and would love to run a sample run for your firm. Samples normally are less than $200.00 depending on the quantity of barrels. An interesting article. Melonite is the registered trade name owned by Durferritt for the Salt Bath Nitriding(SBN)process also commonly called just nitriding. SBN is well known by the gun industry used to provide improved corrosion resistance, resistance to wear and fatique and lubricity. Many major gun companies and parts suppliers use SBN. It is used to replace chrome, black oxide, manganese phosphate surface finishes. SBN is improved metal treating technoloy replacing the above because it provides all the above benefits in one treatment and is very cost competitive. SBN treatment results in hardening the gun metal within the molecular structure so it does not cause the parts to expand or warp nor add to the surface dimension as does chrome. It can be used on gun parts made of high or low alloy ferrous metals and stainless that have been machined, stamped, forged or cast. All SBN treated metal parts are turned black including SS. Its used on SS barrels and slides to kill the reflectivity but also for the improvement of wear on the OD and improved lubricity in the bore that results in longer life and reduced fouling. Magazines, trigger and bolt components, muzzle brake/blast/flash suppressors and choke tubes are SBN treated for the above benefits. The primary consideration in using SBN on gun components is to cost competitively improve performance and provide protection to enhance reliable life function of the gun whether used as a weapon or for sport. You are correct with your statement that Melonite is a registered trademark of HEF Durferritt that is why I am have been working with HEF USA for the past 5 years with R&D development for this product line with firearms components. HEF USA has been a R&D and support facility until last quarter of 08, they agreed to use their facility to process firearms components in Jan. 09 this is the next step is to inform shooters and manufactures of their service. HEF USA also will provide free samples to firearms manufactures for their testing purposes. HEF USA will Quote price based on lot sizes for Melonite QPQ process. Call for informatin and quotes. My only comment to you is that you get what you pay for. Does the shooter want a cheap price or quality product based on 5 years of R&D process development with competive pricing per current industry standards. Important note to M Woolridge: Sorry, but use of the term Melonite by your company is improper. Melonite is a registered trademark of HEF Durferrit, Mannheim, Germany. It’s reputation with the major gun manufacturers has been developed over over many years of application, and no one but HEF USA can authorize the use of Melonite in North America. For a list of authorized Melonite processors, please contact Mike Wright @ HEF USA – mwright@hefusa.net. As would be the reference to a Skill saw or Crecent wrench. BUT! His website does not use the trade name, so an in-passing comment on an article of the process really isn’t a big deal. Had it been all over the site? Go get ‘em. Great article though – I’m about to have my projects treated by this same process (I won’t use the M word since it is by another company) and it will be for a much lower cost – and apprecaite the usage report! Well, the prices sure seem misleading compared to what was originally stated in the article. Until they can provide a service where I can send them a single barrel, have it treated for $100 or (hopefully) less and have it back within a couple weeks, there will not be a huge demand or following for the service. How is it you obtain less friction and yet have a 50 – 100 fps less velocity with the same load as stated in the article. X amount of powder, X grain projectile and considering all things equal, then less friction (should) = HIGHER velocities. What’s wrong with this picture or advertisement? Is there a real advantage and is it in longevity of barrel life because it is not an increase in long range shooting. Sounds to me like just another way to make money and cause the fellow shelling out the bucks to keep shelling out the bucks. I’m not Einstein, but I have enough since to realize less friction = higher speeds/velocity. I noted that to obtain the same velocities you would need to increase powder charge, that is if your a reloader and not loading at maximum charge already. 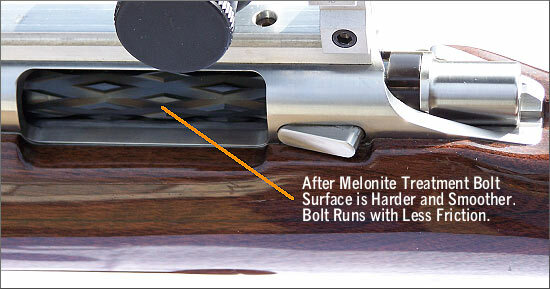 When friction is reduced (as with moly bullet treatment), the in-barrel pressure drops. You need to add more powder (typically about 1.0 grains for a .308) to get back to the same pressure, and equivalent velocities. I have a springfield XDs. The barrel is Melonite finished. they claim it has “a deep penetrating finish that protects against corrosion”. Im going to shoot the hell out of this gun. I will conduct tests and team up with my engineering profressors at MIT to come up with my own findings!! While reading the comments, I noticed that the keyboards are misspelling words. We need to ban all keyboards.